Dentistry is constantly changing and evolving for the better as the years go by. At Framingham Family Dental Care, our doctors are truly committed to staying right at the forefront of these advancements! That’s why our practice is outfitted with plenty of modern technology that can make a big difference in your care experience, improving speed, comfort, accuracy, and more. Please contact us today to schedule your first appointment here in Framingham, MA, or if you have any questions. TMJ disorder is a serious and even debilitating oral health problem that is caused by misaligned or otherwise strained temporomandibular joints. This condition has several possible sources, including the presence of bruxism (teeth grinding), a traumatic facial injury, or a misaligned bite. Whatever the reasons are for its development, please don’t hesitate to let our team know if you’re experiencing chronic jaw pain. We can provide you with a proper diagnosis and also recommend effective therapy as needed for long-term relief. Have you ever wondered what exactly your dentist is looking at when they peer into your mouth? Our Digidoc intraoral camera can answer this question for you! The process is simple – we’ll insert a camera-tipped wand past your lips so that it can start capturing high-resolution images. These images are transferred to our computer system and a TV monitor in the room within seconds, allowing you to see your very own teeth and gums in real time. Our doctors can use this visual aid as both a diagnostic tool and an invaluable educational component that helps patients feel like a fully educated partner in their oral healthcare journey. Many patients are interested in undergoing a cosmetic makeover, but they hesitate before scheduling the appointment. After all, what if you go through all of this only to not like the results in the end? That’s why Dr. Adelina Duka and Dr. Arvi Duka offer digital imaging here in Framingham. All we need is a current picture of you smiling, and we can adjust your look to reflect the results you’d achieve with the help of certain services. This way, you can enter into your chosen treatment plan with 100% confidence. 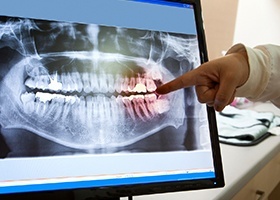 A lot is going on underneath the surface of your smile that our team needs to be able to see, which is why we regularly utilize X-rays. Our doctors use digital sensors from Suni in order to make this process easier, faster, and safer than ever before. Unlike traditional film, digital X-rays don’t require darkroom development or bulky filing systems. Instead, they’re available for viewing seconds after they’re captured on our computer system; in fact, we can magnify and color-code the image for added insight. Plus, radiation exposure is dramatically reduced by up to 80%, which is great news for families. Cavities develop at a gradual pace and aren’t usually identified until they’re reached moderate stages of damage. At Framingham Family Dental Care, our state-of-the-art cavity detection system can find them earlier than ever before, resulting in healthier, less invasive treatment results and more rescued tooth structure that you can keep depending on. We can even locate weakened areas that aren’t visible to the naked eye yet! 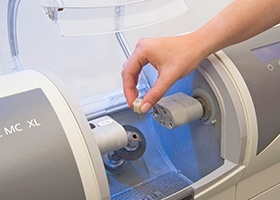 A new dental crown typically takes two appointments to fully complete and place over the affected tooth – at least, it did before CEREC came along. This technology simplifies the restorative process down to a single appointment, saving our patients valuable time without sacrificing the quality they deserve! 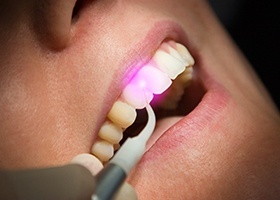 Lasers are the future of quality dental care, and we’re proud to be one of the few dental practices in the Framingham area that uses them on a regular basis. Unlike traditional scalpels, these state-of-the-art tools are highly comfortable and minimally invasive. They also minimize post-operative symptoms like bleeding and help patients recover in record time from treatment.